What’s more basic than cooking–and eating? Summer is the perfect time to cook together, whether you want simple-get-food-on-the-table plans or something to stretch your palate or your cooking skills. Cooking together is fun. It makes a great family activity, but I also love cooking with my friends. There is nothing quite like preparing and eating food together. And the more you do it, the more flexible you can become—and the more likely you’ll find creativity there. So, as a place to start, try some of these. You have to eat, right? Make Something on a Stick. Even toddlers can put food on a stick. 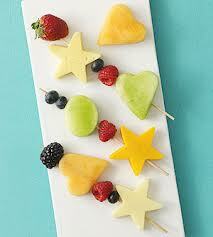 Put chunks of fruit and cheese on a skewer, or cut them in fancy shapes. Think about what else could go on a stick. Ravioli and vegetables? Meatballs and tomatoes? Look for recipes or just explore your cupboards and see what might go together. How about some creative combinations? Make Something Frozen. Summer is the time for all things frozen. Freeze some bananas or freeze some grapes. Make ice cream in a bag or just dump some juice in a paper cup and freeze it. Try some fancy watermelon pops then think about what you could combine. Fruit and juice? Ice cream and cookies? Look around and use your imagination. Make Grandma’s Recipes. 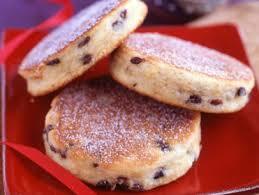 My grandmother made Welch cookies, something like these. When I get out the stained recipe card and make her recipe, I feel ties to generations past the family I’ve ever known. What are those recipes in your family? Share them. Make them. Tell your family food stories—whether they entail mailing chocolate eggs at Easter or the disaster of trying to feed Uncle Bruce strained beets as a baby. 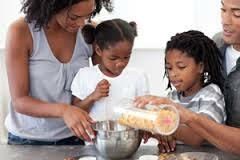 Cooking family recipes will bring the stories to life. Make Something From Scratch. I know this series is less-is-more, and perhaps making things from scratch doesn’t fit your hectic summer life. If so, just ignore this suggestion. But for some families, “less” can also mean back to basics. Learn how food is made. Think of something you usually buy or make with a mix. Make some biscuits. Make freezer jam—its’ not hard at all. Make spaghetti sauce or bake some bread. I’ve been having fun with this recipe. Pick something you love and make it from scratch. Yum! Make Something Silly. Make a pizza with a face. Make a salad that looks like a doll or a pear and chocolate penguin. Then make up your own silly food. OK, so the pear penguins are a complete violation of my less-is-more principle, but they sure are fun. Maybe they are more fun in a video than your kitchen. If so, here you go. Whatever you choose to make—simple, complicated, or silly—take some family time to cook together.